The boy wanted biscuits. I'm not usually one to indulge his every whimsy but I'll use any excuse to try something new. So I came up with another one of my crazy ideas. 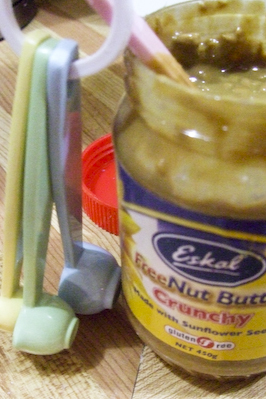 I wanted to try baking with this great peanut butter substitute that I came across at Coles not long ago, FreeNut Butter - it tasted like peanut butter but it was made from sunflower seeds. According to the boy, if I had put the smooth version in a peanut butter jar he wouldn't have noticed the difference. The chunky version is a little more obvious since there are whole sunflower seeds in it. So what flavour to pair with peanut/freenut butter? I went with that silly kid-friend fake grape flavour, channeling the whole PB&J theme. I couldn't help being attracted to this grape bubble gum flavoured cordial in the supermarket called Gubble Bum which I thought was the funniest name I'd seen in a while. Usually I'm not a huge fan of fake fruit flavours, but I was a sucker for grape bubble tape as a kid and this tasted just like it. 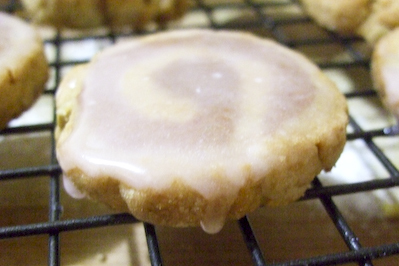 Unfortunately the grape flavour in these shortbread-style biscuits was a little over-powered by the peanut butter, but I made up for it by glazing them in grape-flavoured icing later. Beat butter and sugar together until light and creamy. Add egg to mixture and beat until combined. Split this mixture into two separate medium mixing bowls. Add 125g plain flour and 1/2 tsp baking powder + 1 pinch of salt to each mixing bowl. 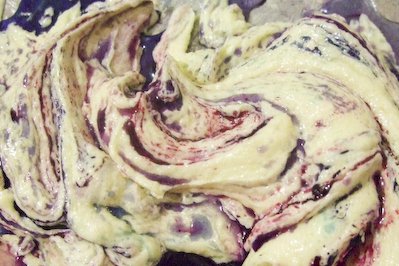 Then add purple food colouring (I added 4 drops red and 2 drops blue) and a tablespoon of grape cordial to one bowl. . Stir until the mixture forms a smooth dough. If the mixture is looking too dry and crumbly, add more grape cordial. 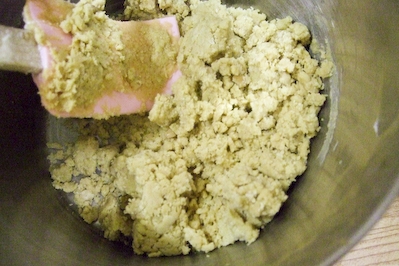 Add 1 tablespoon of peanut butter to the other mixing bowl and stir to form a smooth dough. If the mixture is looking too crumbly (mine was), lay out a sheet of baking paper, wet your hands under the tap and knead the dough over the baking paper until it is smooth and easy to roll out. Roll out the peanut butter dough on the baking paper until it is about 15 x 30 cm (if the dough is sticking to the paper, dust the surface with icing sugar first). 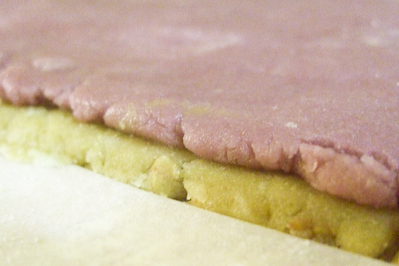 Knead the grape flavoured dough and then roll out on another sheet of baking paper. 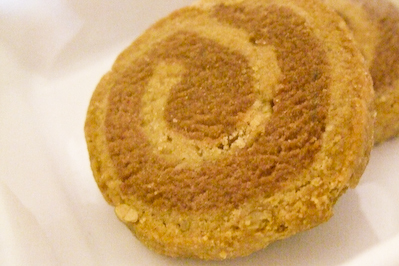 Roll this out to the same size as the peanut butter dough. Gently lift the grape dough and turn it upside down over the peanut butter dough so they line up and then peel the top layer of baking paper off. Using the baking paper underneath as a guide, very carefully and tightly roll up the two layers of dough on the long side to form a cylinder. If cracks start to form try to pat the dough back together but small cracks shouldn't be too much of a bother. Refrigerate the dough for at least 30 minutes. Preheat the oven to 180 degrees C. Remove the dough from the fridge and use a sharp knife to slice out your cookies, about 0.5 cm thickness. 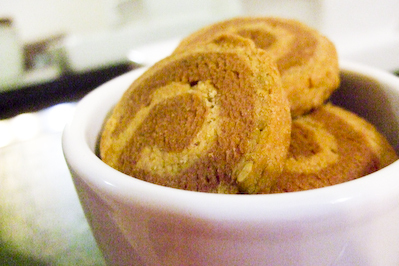 If the cookies crack around the edge as you cut, carefully pat the dough back together. 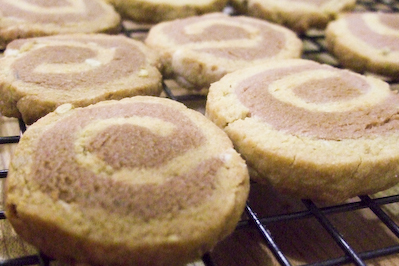 Place cookies about 3cm apart on a lined baking tray and then bake for 12-15 minutes, or until golden on the outside. 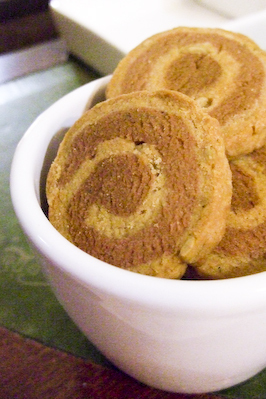 Rotate the tray halfway through to ensure they bake evenly. Remove from the tray and cool completely on a wire rack. If you would like a bit more grape flavour in the biscuits, dissolve 1/2 cup icing sugar in 1-2 tbsp of grape cordial and dip one side of the biscuits into the icing. Love all your crazy ideas! This one is awesome! Always love an original recipe. Very nicely done! I love pinwheels! Great recipe idea! How do you come up with these cool ideas?! Love it!!! Agree with Lorraine - the grape jelly swirl looks to die for! Agree with Ellie - very creative! Awesome! You're a baking genius Steph! The colour contrast is so cute :) As Lisa said - life is better with PBJ! grape and peanut butter is a crazy mix! 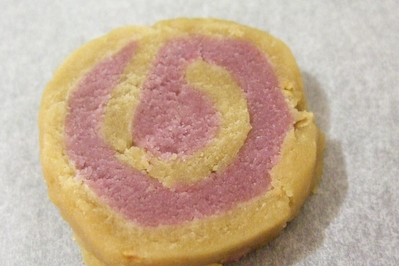 Pity they lost the purple colour during baking but these swirled biscuits look awesome! Ellie - Aw thanks :D I love rolling with my crazy ideas! Conor - me too! thanks! Lisa - I agree, I had my first pb&j sandwich the other morning, it was kinda awesome. Trissa - :D aw thanks hun! Betty - I am a messy baker so i found them kind of frustrating, but the final product was worth it! 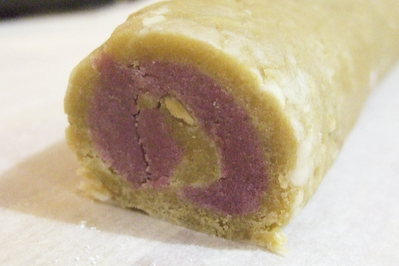 Rilsta - I know, though I'm sure if i had used more food dye it wouldnt have faded as much. The photos make the purple look browner than it did in real life!